Fig 1.0 – Overview of the thoracic spine. The thoracic spine is the second segment of the vertebral column, located between the cervical and lumbar vertebral segments. It consists of twelve vertebrae, which are separated by intervertebral discs. Along with the sternum and ribs, the thoracic spine forms part of the thoracic cage. This bony structure helps protect the internal viscera – such as the heart, lungs and oesophagus. This article will look at the osteology of the thoracic vertebrae, examining their characteristic features, joints and clinical correlations. Vertebral body is heart shaped. Presence of demi-facets on the sides of each vertebral body – these articulate with the heads of the ribs. Presence of costal facets on the transverse processes – these articulate with the tubercles of the ribs. They are present on T1-T10 only. 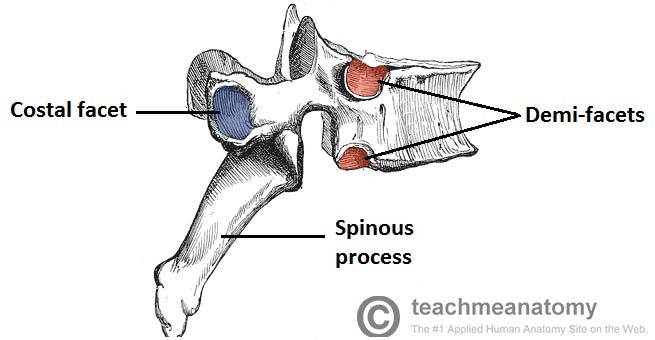 The spinous processes are long and slant inferiorly. This offers increased protection to the spinal cord, preventing an object such as a knife entering the spinal canal. Fig 1.1 – Lateral view of a thoracic vertebrae. In the majority of the vertebrae (T2-T9) these facets are demi-facets. There are some atypical vertebrae that possess whole facets. The atypical thoracic vertebrae display variation in the size, location and number of their superior and inferior costal facets. T1 – Superior facet is not a demifacet, as this is the only vertebrae to articulate with the 1st rib. T10 – A single pair of whole facets is present which articulate with the 10th rib. These facets are located across both the vertebral body and the pedicle. T11 and T12 – Each have a single pair of entire costal facets, which are located on the pedicles. The joints of the thoracic spine can be divided into two groups – those that are present throughout the vertebral column, and those unique to the thoracic spine. Fig 1.2 – Articulations between a rib and its numerically corresponding vertebrae. The articulations between the vertebrae and the ribs are unique to the thoracic spine. For each rib, there are two separate articulations – costovertebral and costotransverse. Within this joint, the intra-articular ligament of head of rib attaches the rib head to the intervertebral disc. Only slight gliding movements can occur at these joints, due to the close articulation of their components. The costotransverse joints are formed by the articulation of transverse processes of a thoracic vertebra and the tubercle of the adjacent rib. They are present in all vertebrae except T11 and T12. The thoracic spine is strengthened by the presence of numerous ligaments. Anterior and posterior longitudinal ligaments: Long ligaments that run the length of the vertebral column, covering the vertebral bodies and intervertebral discs. Ligamentum flavum: Connects the laminae of adjacent vertebrae. 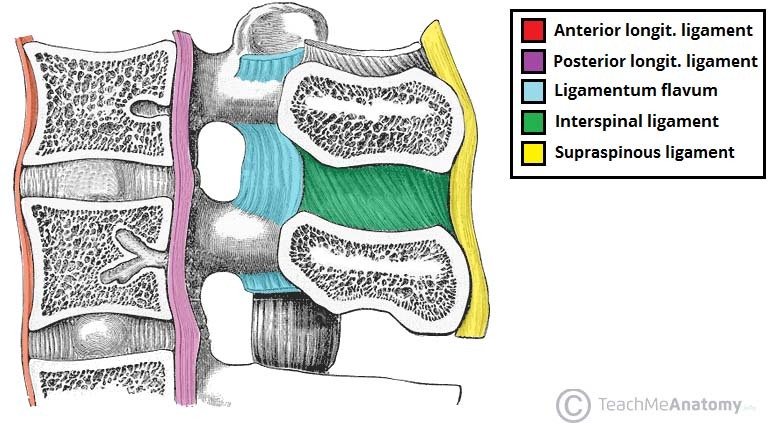 Interspinous ligament: Connects the spinous processes of adjacent vertebrae. 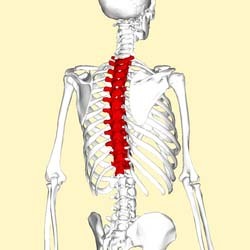 Supraspinous ligament: Connects the tips of adjacent spinous processes. (Note: In the cervical spine, the interspinous and supraspinous ligaments thicken and combine to form the nuchal ligament). Radiate ligament of head of rib – Fans outwards from the head of the rib to the bodies of the two vertebrae and intervertebral disc. 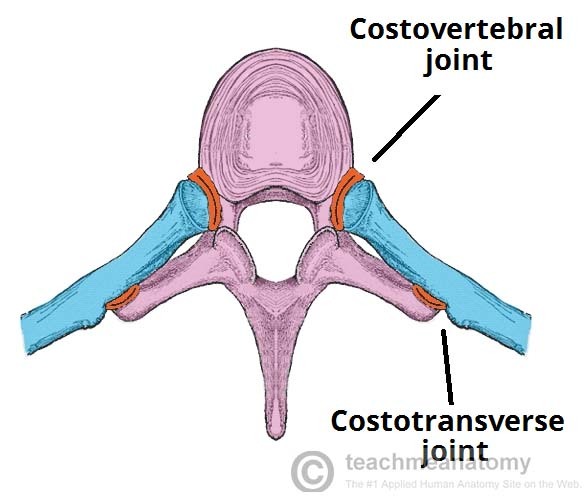 Costotransverse ligament – Connects the neck of the rib and the transverse process. Lateral costotransverse ligament – Extends from the transverse process to the tubercle of the rib. Superior costotransverse ligament – Passes from the upper border of the neck of the rib to the transverse process of the vertebra superior to it. 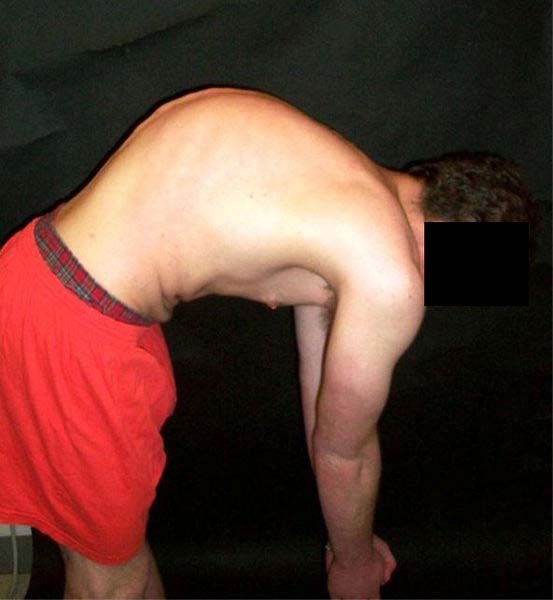 Kyphosis is an excessive curvature of the thoracic spine, causing the back to appear “hunched”. It may occur for a number of reasons early in life. These include poor posture, abnormally wedge-shaped shaped vertebrae (Scheuermann’s kyphosis), and fusing of vertebrae during development. Various diseases can also lead to kyphosis in adults. The most common cause is osteoporosis – a condition whereby bone mass is lost (mostly in older people). This leaves the spine less able to support the weight of the body, thus resulting in characteristic kyphosis. What is a characteristic feature of the thoracic vertebrae? Which of these ligaments is unique to the thoracic spine? Which part of the ribs do the thoracic vertebral bodies articulate with?